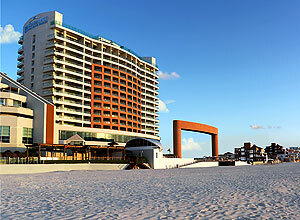 This 285 room all-inclusive beachfront resort is located on the Caribbean Sea, near Cancun's central hotel zone. Palace Resorts designed this hotel to be the ideal family resort, offering a fresh ultra-modern architectural design and luxurious amenities. This chic hotel provides elegant accommodations overlooking the Nichupte Lagoon and the Caribbean Sea, featuring a Kids Club, great family activities, and a state-of-the-art spa. Theme events and entertainment are family friendly.